Supporting Apple iOS 11 and earlier, MaaS360 enables you to manage and take instant advantage of the latest version updates on iPhones and iPads. MaaS360 also offers support for macOS versions 10.5 through 10.13 High Sierra. MaaS360 provides simple, over-the-air (OTA) enrollment and a unified, consistent workflow independent of device form factor to give you the visibility and control you need to manage all macOS devices. 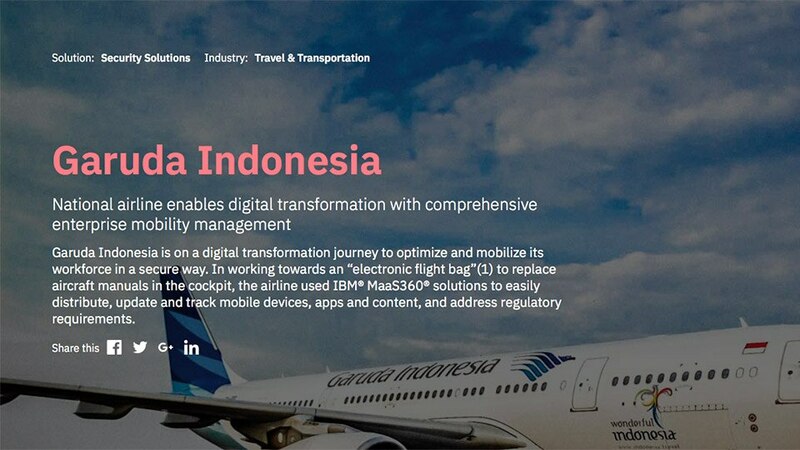 MaaS360 provides the visibility and control IT needs to secure Android smartphones and tablets in the enterprise. MaaS360 includes support for Android in the enterprise, Samsung Knox and Android version 2.2 and higher. With same-day support for Android Oreo (8.0), you gain instant access to the latest security and productivity functionality available through the platform. MaaS360 can help IT organizations address the challenges presented by today’s divided device landscape by providing a single, intelligent solution for the deployment, management, security and monitoring of end-user devices—from Windows XP desktops to the latest Windows 10 tablets—and everything in between. 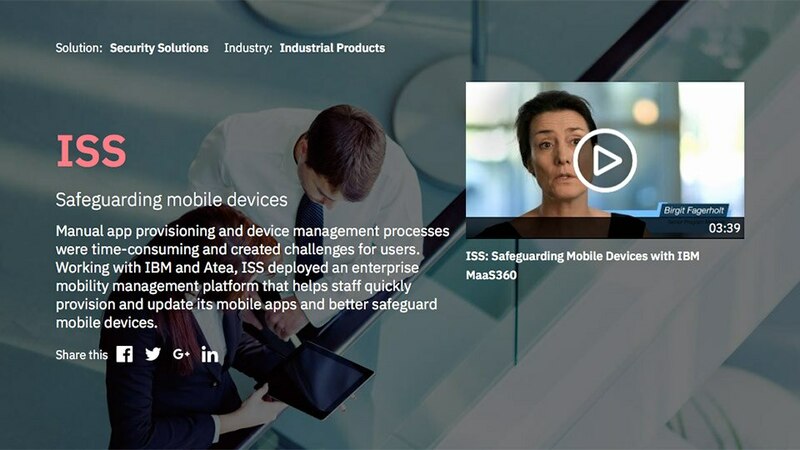 The MaaS360 Container App for iOS, Android, and Windows helps maintain a safe and protected on-the-go workspace, especially in support of bring your own device (BYOD) and data leakage prevention (DLP). Only approved and valid users can gain access sensitive data. You can restrict sharing by users, forwarding of attachments and copying and pasting. Devices that are lost or stolen can be selectively wiped to remove the secure container and other enterprise apps, data or profiles. 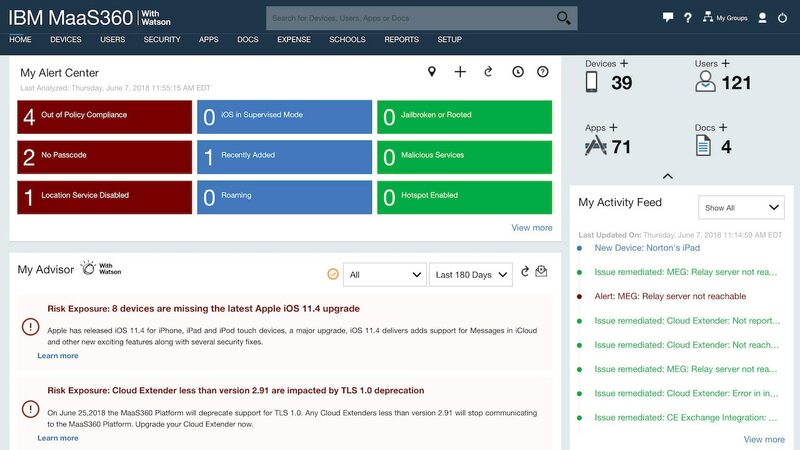 With Watson, MaaS360 Advisor delivers opportunities, risks and general information to help you make sense of the erratic endpoint behavior you encounter daily. Advisor sources insights from structured and unstructured data, giving administrators ample, relevant context to make their most important decisions. Each insight is tailored to your industry, company size and the construct of your environment, including your devices, their platforms and most commonly used apps. The MaaS360 Policy Recommendation Engine eliminates the guessing game that IT teams normally play when configuring their security policies with real-time cognitive templates based on industry, region and deployment size. As policies are being configured, recommendations will be dynamically displayed that clearly indicate how current inputs match up to peers. If administrators choose to apply the recommendations, they can do so with the simple click of a button. With Business Dashboards for Apps, MaaS360 UEM administrators gain robust app intelligence and reporting capabilities, which help them understand the full assortment of enterprise apps deployed and a means to determine which ones need attention and prioritization. The dashboards are organized to help you get a full understanding of your enterprise app deployments across several key categories, including installs, usage, performance, and trends. MaaS360 Patch and Update Management helps IT teams identify macOS and Windows laptops that are out of compliance and address issues by pushing or scheduling installations. Enterprise mobile end-users need a simple, secure way to access corporate apps and resources from any device – whether at the workplace or on the go. MaaS360 Identity Management makes it easy for IT & Security leaders to implement single-sign on (SSO) for quick access to approved apps, enforce conditional access for compliant, recognized users, and roll out a unified app catalog for easy app discovery. MaaS360 Mobile Threat Management helps you to detect, analyze and remediate malware on mobile devices to protect your organization against fraud and data breaches. MaaS360 provides advanced jailbreak (iOS), root (Android) and hider detection with over-the-air updates for security definitions pulled from a continually updated database. Administrators can set security policies and compliance rules to automate remediation — improving the security of BYOD and corporate-owned devices. MaaS360 Mobile App Security covers your public and private apps with a host of options from native-like unified app catalogs across iOS, macOS, Android and Windows, app wrapping (SDKs) for data leak prevention, to app-level tunneling for easiest access to corporate data when employees are on the go. TeamViewer Remote Support for MaaS360 enables IT to remotely view end users’ iOS, macOS, and Android devices in addition to Windows laptops and desktops - exactly as if they were seeing the device interface in person. With these real-world views, IT can quickly change or guide the user to change settings, add applications or remediate connectivity issues to get employees back to their jobs as quickly as possible. You're juggling MDM, EMM, and new platforms to manage IoT. MaaS360 unified endpoint management eliminates the need for multiple platform investments, effectively saving time and increasing the efficiency of IT professionals. You need unified security for endpoints, users, apps & data. MaaS360 supports all major endpoint OS versions including: Apple iOS and macOS, Google Android, and Microsoft Windows – ranging from legacy Windows XP SP3 to the modern Windows 10. There's no way to analyze the vast volume of endpoint data. With Watson™, the MaaS360 cognitive UEM platform works as a trusted advisor to deliver cognitive insights, contextual analytics, and cloud-sourced benchmarking capabilities that elevate IT by enabling more productivity and a more secure environment. Windows 7 needs to remain patched, updated, and secured. By converging both API sets and agents, MaaS360 UEM allows IT to manage both modern and legacy PC platforms side by side - effectively transitioning to Windows 10 without using separate solutions or investing in new tools. It's a struggle for IT to keep up with rapid device growth. Put your expense, maintenance, scaling, and hosting woes behind you. MaaS360’s software-as-a-service (SaaS) delivery model scales effortlessly as you continue to take more endpoints under your control - and makes it easy to pay as you grow.